What’s New in NinjaTrader 8? Completely redesigned Alerts functionality allows for execution of complex multifaceted conditions without programming experience. A streamlined & dynamic interface maintains familiarity for consistency while optimizing workflow. A rewritten core data engine improves the way market data is processed when received from your data provider. Strategies which previously required a higher time resolution programmed for greater accuracy can now achieve this same level of granularity by simply setting a custom resolution. The new “Trading Hours” window allows users to exclude certain calendar dates from charts and strategies as well as set a customized End of Day time for a particular date. Modern design techniques deliver greater performance and flexibility than ever before. Within one week of a expiration date, an option to automatically rollover all Futures instruments you have active will be displayed in the Tools-> Database window. This process will update all features in your workspace to ensure you are using the current expiry. “On-the-fly” instrument switching significantly reduces the time it takes to switch an interface from one market to the next. This feature also includes a quick search button to easily navigate to the Instrument Window directly. Market Replay now has an optional “Historical” mode which allows you to playback your regular tick data. Playback instruments and types which are not available through Market Replay and quickly analyze how bars and indicators may have formed in real-time. 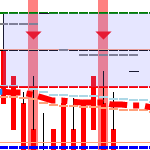 Configure a price action indicator to a SuperDOM or Chart and watch as your working orders are modified to follow the price of the indicator precisely on each tick, on price change, or on bar close. No programming needed and defined completely through the user-interface. Market-If-Touched orders can now be used in place of limit orders and Profit Targets to hold in a prepared state until a trigger price has been reached at which point a market order will be issued. MIT orders can still be used locally if not supported by your brokerage. With increased support and the introduction of additional NinjaScript types, you are no longer limited to writing custom indicators and strategies. The possibilities are truly endless: build what you can dream of and integrate it directly into the NinjaTrader 8 application.